Tori Soboro (ground chicken, seasoned with soysauce, etc.) is one of typical home dishes I’ve loved all my life. It’s often served over rice as a topping. For making small amount of Tori Soboro, small-size donabe works perfectly. 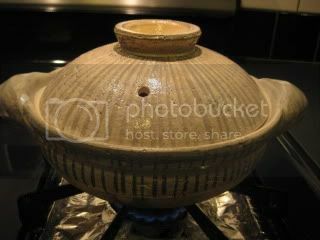 This time, I used mini-size classic-style donabe, “Rikyu Tokusa”. The recipe for Tori Soboro is extremely simple. First, you combine dashi (or water is just fine! ), sake, soy sauce, sugar, and mirin in donabe. Add ground chicken and stir as it’s cooked so that the chicken will finely break apart and won’t stick together. Once the broth (sauce) is reduced down to quite low, it’s ready. 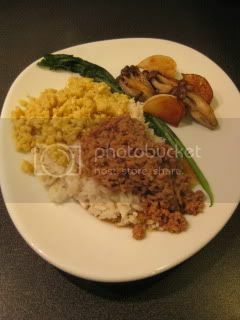 Or, like I did this time, you can thicken the sauce by adding the mixture of kuzuko (arrowroot starch) and water to finish. 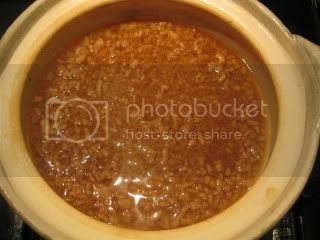 Mmm…Tori Soboro Gohan (rice) is ready. Donabe rice was topped with hot Tori Soboro, Iri Tamago (crumbly seasoned egg), grilled shimeji mushrooms, kabu (Japanese turnip), and kabu leaves. Fantastic! 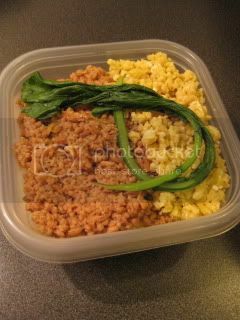 With leftover, I made obento (lunch box) for next day. Yes, cold/ room temerature Tori Soboro Gohan is also very nice. It used to be one of my favorite obento items when I was a student (my mom’s tori soboro!). You can find the basic tori soboro recipe on toiro’s website.